LONDON--(BUSINESS WIRE)--Technavio analysts forecast the global personalized gifts market to grow at a CAGR of more than 9% during the forecast period, according to their latest report. The research study by Technavio on the global personalized gifts market for 2017-2021 provides detailed industry analysis based on skill and technology (hand decoration, embroidery, engraving, printing, and carving), product (photo and non-photo personalized gifts), retail format (in-store and online), and geography (the Americas, Europe, APAC, and MEA). The global personalized gifts market size is expected to reach USD 31.63 billion by 2021. The Americas is predicted to be the leading regional segment, generating both highest revenue and maximum incremental growth through the forecast period. “The gifting culture is evolving with an increasing number of occasions when gifts are exchanged. Consumers customize gifts through personalization, configuration, or on-demand printing to add value and make their gifts unique,” says Poonam Saini, one of the lead analysts at Technavio for retail goods and services research. Seasonal decorations, such as decorative cups, plates, and napkins, account for a major portion of the total revenue generated in the market. Also, the growing home and wall décor market have also been aiding in the expansion of the growth opportunities for personalized gifts. The demand for these gifts usually experiences a surge during holidays like Christmas, Halloween, Easter, and Hanukkah. Product innovation is a requisite for this market to generate consumer interest and as an extension, its sales. A notable example is Hallmark's recent launch of Hollywood-inspired decorative ornaments based on the popular characters from popular movies, which created a lot of revenue for the market. Currently, eco-friendly gifts and novelty items are garnering significant consumer interest, particularly in children’s toys. Also, to retain consumer loyalty and increase sales, manufacturers are streamlining design and building more efficient ordering processes, enhancing customization capabilities, and brainstorming new ideas. “Retail participation across various distribution channels is an important factor that determines the growth of the global personalized gifts market. Even in the digital age, a high percentage of consumers prefer buying goods from brick-and-mortar stores, due to the personalized nature of these products,” says Poonam. Mass merchandisers, such as Walmart and Target, and pharmacy chains such as CVS Pharmacy and Rite Aid have equipped their stores with dry minilabs, which can provide on-site photo personalized gifts. Additionally, gaining consumer interest and building a brand image through the social media platform is increasing as it is cost-effective and it usually gets faster responses from a large customer base. Become a Technavio Insights member and access all three of these reports for a fraction of their original cost. As a Technavio Insights member, you will have immediate access to new reports as they’re published in addition to all 6,000+ existing reports covering segments like cosmetics and toiletry, luggage, and pet supplies. This subscription nets you thousands in savings, while staying connected to Technavio’s constant transforming research library, helping you make informed business decisions more efficiently. 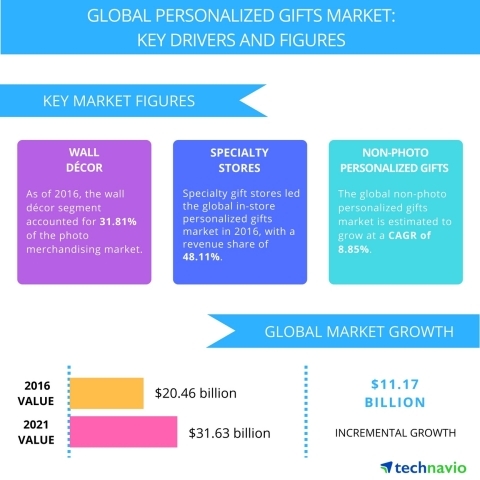 Technavio analysts forecast the global personalized gifts market to grow at a CAGR of more than 9% during the forecast period, according to their latest report.